This Women’s Month, The Glass Recycling Company (TGRC) is celebrating women in recycling and the positive impact they have on both our environment as well as communities. And as an example, the story of glass recycling entrepreneur, Lorraine Mpule Matlou, bears testimony to this passion, effort and drive that goes into making a difference. Back In 2008, Lorraine and her late husband, Doctor Molao who was at the time unemployed, identified a business opportunity that involved collecting waste glass in and around Germiston and immediately set about turning this opportunity into reality. Part of their strategy included targeting restaurants and pubs in the area that were generating high amounts of waste glass – most of which was finding its way directly to nearby landfills. Through determination, passion and no small amount of hard work, the couple steadily grew their glass recovery business and, a year later, they were in a position to purchase their first bakkie. With their business operations now having grown exponentially and poised for further growth, they turned to TGRC, who supported their ambitions by supplying wheelie bins and safety equipment. This support was the turning point in the fortunes of the business. “We no longer needed to cover the costs of the large drums that had to be placed at the establishments we were collecting glass from and could invest the resulting savings back into growing our business,” she explains. Additionally they also registered their business with a glass manufacturer, which allowed them to directly supply that company with waste glass. In virtually no time at all, the couple’s hard work and innovative thinking had paid off as they also acquired a four-ton truck, which enabled them to collect even greater volumes of glass and quickly found themselves delivering up to four loads of waste glass per day to the glass manufacturer. Sadly though, in 2015 Doctor passed away which put additional pressure on Lorraine as the workload associated with operating a thriving business proved immense as she not only found herself having to drive one of the two trucks the business now owned during the day but also having to attend to administration matters in the evening. To keep herself from becoming overwhelmed, she once again turned to TGRC for guidance and support on how to manage the growing business more effectively. She attended two training seminars, hosted by TGRC, which helped her to better understand and operate her business, especially from a financial point of view. Thanks to Lorraine’s dedication, tireless commitment, and her ongoing partnership with TGRC, the number of sites that are serviced by her glass collection business has more than doubled since she and Doctor first went into business. She is also in the final stages of establishing a buy-back centre in her area, with further help of TGRC. 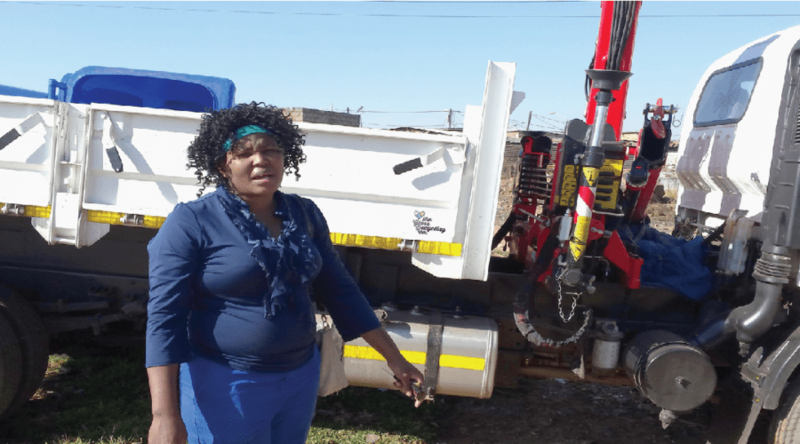 Her trucks will soon be collecting bags of recyclable glass from people in the surrounding townships as part of Lorraine’s commitment to uplifting women in these areas and empowering them to earn an income for both themselves and their dependents.